Monitoring dividend increases for stocks my watch list is one way to identify candidates for further analysis. This week, 31 companies on my watch list decided to increase their dividends, including 3 of my DivGro holdings. Part 1 of this article reported on nine Financials sector stocks and three MLPs that announced dividend increases last week. Part 2 reports on 19 companies in sectors other than the Financials sector. Companies can only increase their dividends regularly if earnings grow sufficiently. One way to identify dividend growth stocks for further analysis is to monitor dividend increases. This past week, 31 companies on my watch list decided to increase their dividends. Part one of this article reports on nine Financials sector stocks and three MLPs that announced dividend increases last week. Founded in 1975 and based in Redmond, Washington, Microsoft Corporation (MSFT) develops, licenses and supports a wide range of products and services related to computing. The company’s products include operating systems, server applications, productivity applications and business solutions, desktop and server management tools, software development tools, video games, and online advertising. MSFT also designs, manufactures, and sells hardware, including gaming consoles and PC hardware products. MSFT is a Dividend Contender with a streak of 15 years of dividend increases. It pays quarterly dividends in March, June, September, and December. The current dividend is 39¢ per share, so MSFT yields 2.49% at the recent share price of $62.74. MSFT has an impressive DGR (dividend growth rate). The stock's 10-year DGR is 14.8%, while its 5-year, 3-year, and 1-year DGR's are 16.7%, 14.9%, and 14%, respectively. Every month, I rank a selection of David Fish's CCC dividend growth stocks and present the top 10 ranked stocks as candidates for further research. This article reveals the top 10 ranked stocks for January. A year after resuming the monthly 10 Dividend Growth Stock series, I look back to see how the year-ago selection performed. Last week, fourteen companies on my watch list announced dividend increases, including one of the stocks I own in my portfolio. 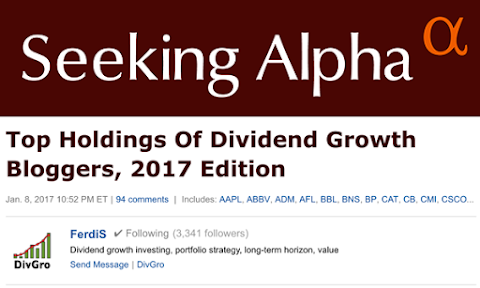 Welcome to my 16th quarterly review of DivGro, concluding four years of dividend growth investing and blogging! My quarterly reports summarize the actions I've taken during the preceding quarter. Quarterly reports include summaries of dividends received and changes that impact dividend income. In the fourth quarter of 2016, I continued preparing DivGro for options trading. I reduced the number of stocks in my portfolio from a high of 66 stocks at the end of June 2016 to "only" 46 stocks at present. I used the cash from closing those positions to round out the number of shares of other positions to 100 shares or multiples thereof, ready for options trading. Q4-2016 is my first quarter of serious options trading. I executed now fewer than 27 options trades (compared with 16 trades in Q3-2016 and 2 trades in Q2-2016). Option income totaled $4,485 in Q4-2016 (and $7,708 in 2016). This week, five companies on my watch list declared dividend increases, including one of the stocks I hold in my portfolio. Based in Bentonville, Arkansas, Wal-Mart Stores, Inc (WMT) is the world's largest retailer and private employer, with over two million employees. The company is a multinational retailer consisting of more than 11,500 stores under 63 banners in 28 countries. WMT was founded in 1945. WMT is a Dividend Champion with an impressive streak of 43 years of dividend increases. It pays quarterly dividends in January, April, July, and October. The current dividend is 50¢ per share, so WMT yields 2.98% at the recent share price of $67.13. WMT's dividend growth is slowing. The stock's 10-year dividend growth rate is solid at 11.8%, but its 5-year, 3-year, and 1-year dividend growth rates tell a sorry tale: 7.3%, 3.3%, and 2.1%, respectively. Last year I decided to consolidate several portfolios into DivGro, my portfolio of dividend growth stocks. My goal was to manage all holdings as if they were part of a single portfolio. I did not actually transfer stocks between accounts and brokerages. Instead, I just added a column to my portfolio tracking spreadsheet to identify the host account. If you visit my Portfolio page, you'll see a composite view of several accounts (though its is not apparent!). In fact, some stocks are even split across different brokerages. For example, I own shares of Target Corporation (TGT) in a so-called JTWROS account at FolioInvesting and in a trust account at Scottrade. Having a single view of my DivGro portfolio regardless of the account or brokerage that hosts the individual stocks, simplifies things for me. I don't have to update (or manage) multiple portfolios. The last month of 2016 was quite busy for DivGro. I closed three positions and used some of the cash to buy additional shares in existing positions. In some cases, these buys allowed me to execute additional covered call trades and to collect premium income. Regular readers would know that I started trading options in 2016 to boost DivGro's dividend income. In December, I added another $2,034 in options premiums. Each option sold represents a potential obligation until it expires or gets exercised. I label options income as secured income only when I no longer have the obligation. Please read my December 2016 options update for details. December was a record setting month for dividend income. 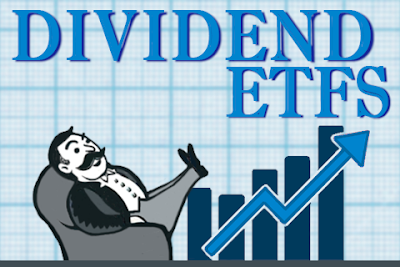 I collected $1,407 in dividends, an increase of 83% over December 2015's dividend income of $770. I just love quarter-ending months! DivGro's projected annual dividend income (PADI) increased to $12,376, well above my goal of $12,000. The significance of $12k is that I can expect dividend income of at least $1,000 per month, on average, in perpetuity. (That's just a cool word meaning indefinitely or forever... and, of course, I'm assuming my portfolio stays the same and no companies cut their dividends). This article presents the top dividend growth stocks held by established dividend growth bloggers with public portfolios. An analysis of stocks in these portfolios reveals Johnson & Johnson (JNJ) to be the most popular holding. I rank stocks by appearance frequency and by proportional weight, taking the relative size of each holding into account. Readers that manage their own dividend growth portfolios may find it interesting to compare their portfolios to the Top Holdings of Dividend Growth Bloggers. In January 2013, I joined a growing community of dividend growth (DG) bloggers when I created DivGro. As a rookie blogger, I learned a lot by reading other DG blogs and scouring them for good ideas. For me, the best learning came from reviewing the public portfolios of DG bloggers. Companies that regularly raise their dividends show confidence in the potential growth of future earnings. Recently, 8 companies on my watch list announced dividend increases.